The following is a re-airing of Harry’s text work session taken from the full episode with him. In this excerpt we discuss singing a Noel Coward song and performing Shakespeare’s King Lear. Harry Groener is probably most familiar to audiences for his musical theatre work in New York, as well as being a series regular on the ’90s sitcom Dear John with Judd Hirsch, and playing Mayor Wilkins on the show Buffy the Vampire Slayer. Harry has received many recognitions for his stage work, including three Tony nominations (Oklahoma!, Cats, Crazy For You), an LA Ovation Award (Equivocation), an LA Drama Critics Circle Award (King Lear), the Joseph Jefferson “Jeff” Award (The Madness of George III), as well as a Theatre World Award and a Drama Desk Award nomination (both for Oklahoma! ), just to name a few. 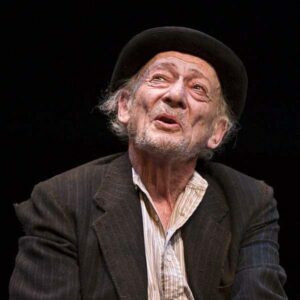 He has performed in regional theatres across the country, including the San Diego Old Globe Theatre (where he is an associate artist), Mark Taper Forum, Westwood Playhouse, South Coast Repertory, Pasadena Playhouse, Long Wharf Theater, A.C.T., and the Williamstown Theater Festival. Film/TV work include About Schmidt, Patch Adams, Road to Perdition, How I Met Your Mother, Breaking Bad, The West Wing and Star Trek: The Next Generation, Voyager, and Enterprise. Please enjoy the text work with Harry Groener! Want to hear more from Harry? Check out my full talk with him here!